Sinhala and Tamil New Year, which is a remarkable festival in Sri Lanka, was originated from the old ritual of Suriya Wandanawa. The objective of the feast is to get together with the family members. One of the key aspects of getting together with the family members and relatives is engaging in New Year games. Among the most pronounced areas of the New Year festivities, New Year games are one of the most prominent. New Year games can be categorized mainly as indoor and outdoor games. Regardless of the age of the player, everyone is invited to participate in these games during the New Year season enhancing unity while eradicating their old misunderstandings. Considering the indoor games, Pancha Dameema is one of the most significant indoor games. It is also known as Pancha Keliya, Kavadi Dameema, and Bello Dameema. This is played using five seashells, a coconut shell, and a chart. Players are divided into two groups. Apart from this, Olinda Keliya is another famous indoor game which uses a wooden board which is also known as Olinda Kolombuwa/ poruwa with several holes. Unlike Pancha Dameema, Olinda Keliya is played by 2 players while 9 holes are placed 4 beads each. Beads are shifted by the two players from one hole to the other. Then, they collect all the seeds found in the hole right after an empty one. The winner of the game is the player with a greater number of seeds. Kaju Dameema is another indoor game that has entertained Sri Lankans over the years. Outdoor games such as pillow fight, Onchili pedeema, Kana mutti bindeema, placing the eye on an elephant, Raban geseema are more exciting than indoor games. Placing eye on the elephant is a fantastic experience for the participants where they must mark the elephant’s eye while being blindfolded. Other common outdoor games are bun-eating competition, Tug-o-War and climbing the greasy pole. Old national folk games become more significant during the New Year season. Even though folk games such as Eluvankeliya, Mevarasellama, Rabanupatha, Buhukeliya, Muttigesilla, Muthukeliya and Meesellama are not as famous as the previously mentioned games, they carry the major characteristics of a worthwhile culture that we all belong as Sri Lankans in a multicultural background. Presently, games such as Olinda keliya, Kotta pora, Kana mutti are more famous than the folk games which has been significant during the past centuries. Apart from that every year, across the country, people choose their Avurudu Kumaraya and Kumari. The young girl and boy arrive dressed in traditional clothes symbolizing the dawn of the New Year to Sri Lankans. However, currently, the Sinhala and Tamil New year celebrations have become a national fiesta engaged in the celebration of family and togetherness along with harmony between all communities. It is a symbol of peace and harmony. 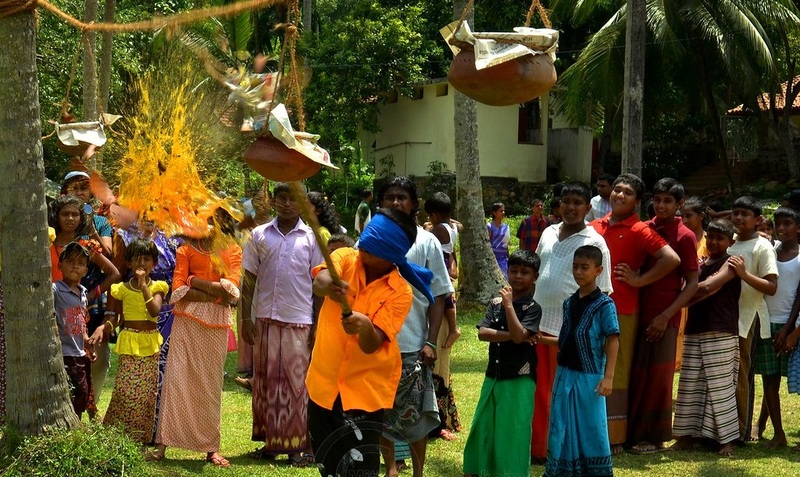 Even though today New Year appears to be more commercialized and is becoming an advertising tool for the commercial media, it is our duty to protect our traditional folk games because, Sinhala and Tamil New Year games are not just another type of games but a valuable cultural event full of traditional and cultural values. As MoraSpirit, we wish everyone a happy and prosperous New Year where you find joy with your family and beloved ones by engaging in New Year festivities, and especially, New Year games. Clash of the origins - What to expect?